Broilmasters R3B Series Infrared Combo gas grills feature two burner styles, infrared and conventional, for a total of 40,000 BTUs of cooking power. With this burner combination, the variety of foods cooked on the grill are endless. 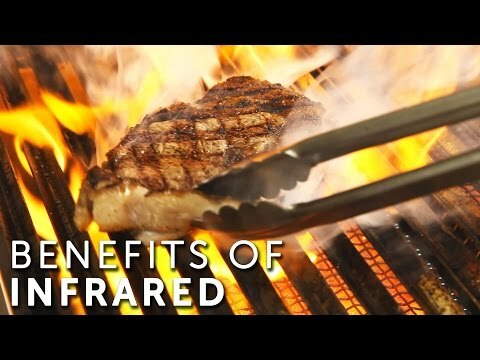 Sear steaks with the infrared burner, while cooking vegetables with the conventional burner. Both burners operate independently for a broad temperature range. The Broilmaster Infrared Combo grills also feature 695 square inches of total cooking area, V-Channel cooking grids and multi-position lid stop for more precise temperature control. This grill comes with heavy-duty stainless steel in-ground post for permanent installation. Broilmaster offers a Limited Lifetime Warranty on Aluminum Grill Housing (except paint), Stainless Steel Rod Cooking Grids, Stainless Steel Griddle, Cast Stainless Steel or Porcelain-Coated Cast Iron Cooking Grids, Select Stainless Steel Components - Cart, Mounting, Bowtie Burner, Side Burner (DPSBSS), Side Burner Housing, and Warming Rack and Stainless Steel Built-in Kit for P3/H3 Grill Head; 10 Year Warranty on H Series Stainless Steel Burner, Side Burner (DPASBC), Side Burner Housing (BSA); 5 Year Warranty on Infrared Burners on R and R3B, Flare Buster Flavor Enhancers, Painted Electro-Galvanized Steel Components and Stainless Steel Smoker Shutter; 2 Year Warranty on Porcelain Coated Steel Briquet Racks, Chrome-Plated Warming Rack, Stainless Steel Flavor Screen and Stainless Steel Heat Shield; 1 Year Warranty on Valves, Knobs, Ignitors, Labels, Hoses, Fittings, Paint on grill head, and all other parts and accessories. 25 1/2 X 17" 25 1/2 X 17" 20 5/8 X 16" 25 1/2 X 17"